Really bad on last gen. Drive Club delay prevented to be even worse overall. Sony sending 500k to Asia doesnt tell us what they have allocated to the US. And again, shipping more doesnt necessarily equal selling more. What's the saturation point for a new $500 console in its 2nd month? We may find out. XB1 is not in an "instant sell out" situation. 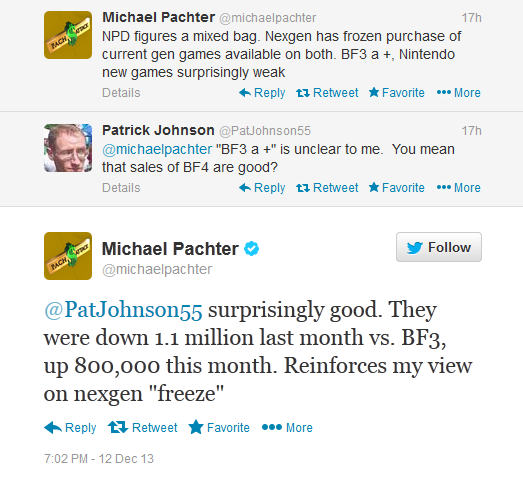 BF4 up almost a million in November thanks to Next gen? Looks like the majority of early adopters are core fps fans. Are we allowed to reference ******** stats here? I know a lot of people don't consider them very reliable. Anyway, they show Xbone well ahead of the PS4 in NA for the first week of December. Dat constrained supply. Though PS4 still ahead in overall sales... and it sounds like Sony have the supply to NA in hand now, so it should be tops in December when all is said and done. EDIT: Guess we can't reference that site! Lesson learnt. Sony can only produce a certain number of consoles a month(i heard about 1 million). If they send 500k to Asia, 100k to europe, then only 400k left for NA, which includes Canada and Mexico. Meanwhile Microsoft probably sends 90% of their units to US, with a small portion going to the UK. Sony won't be able to keep up, at least in December. They're nothing more than nonsensical, corrupt garbage...I know this because I have done a good amount of research into their ridiculously flawed methodology. NPD is the only sales tracker for USA. The site you mentioned is no more accurate than your average GAF prediction. So, assuming that Sony can only make slightly more than 1.22m units in a month and 500k are going to asia that leaves 720k units for NA and EU with something to the effect of a 500k/220k distribution between the two. For the Xbox1 to exceed that, it will need to do better than 50% of its black friday/november sales effectively while Sony will be limited to roughly to 44% of november sales due to supply. With shops retaining xbox1s in store, due to demand falling off (regionally), in addition to other anecdotal evidence like the best buy PR guy giving the nod to PS4 over Xbox1 earlier in the thread (quoted, not actual posting) it is really hard to say that the Xbox1 is going to perform this feat that easily, if at all. January will be an interesting month in general for the after game summary of the holiday season. This is what they should be doing, positioning the Vita as a serviceable niche device. This allows them to rid the perception of succeeding by huge numbers (LT), edging out a profit in the process and providing an acceptable deal of support for Vita owners in addition to continue sustaining those high attach rates. That's probably in part why Sony is making a big deal over all of the indie support for Vita. We do see tons of requests for Vita SKUs of kickstarter projects, and most of them make that funding. What I find funny is the "Global Hardware Total" put XB1 at 1.9 million but in the section "Recent Articles" they have "Microsoft: Xbox One Sales Top 2 Million Units in 18 Days"
December is the best month for sales. I think people buying xmas presents will eat up the supply for both consoles. So in that case, supply will dictate who sells more. After December though, I think Sony will be able to pull ahead. There is nothing superficial about comparing sales in a sales thread. The "brain drain" is irrelevant. They make decent games that sell a lot, that's all MS asks of them. They have ip that gamers are fond of, that's all MS needs to shop out to a credible developer (hence, KI, and probably Perfect Dark in the near future). They also were a big part of making avatars a thing on 360, and they are releasing the first Kinect 2 game that anyone cares about in the spring. My mistake on LBP 2, I must have been thinking about the Vita version or Karting. Of course there's nothing superficial about comparing sales but the manner in which you were presenting them up until this post was (even then those sales fall short of LBP). Just saying 'well both studios have some critical reception and some sales success' is a gross oversimplification. Karting is the only LBP title to under perform, well the Vita version, sure, but it's still probably doing well relative to other software on the platform. When the original poster made the comparison it sure didn't seem like he was only referencing the new Rare. Even then, they certainly have been great for farming out the grunt work for making Avatar items, but virtually any studio can do that. They've had success with the Kinect Sports titles sure, not on par with LBP. Heck the original LBP1 has probably sold as much as the entire Kinect Sports IP; consider it was at +4.5 million in 2010. We'll see how Kinect Sports: Rivals does. The old rare is dead. Barely anyone cares, or they would have bought Banjo and Viva when they had the chance. That's really the point though, the old Rare was a complete mismatch for the Xbox brand and was basically killed off. MM has had nothing but success with Sony from day 1 (baring Tearaway sales on a struggling system). The guy originally said 'MM is as much of a mismatch for Sony as Rare was for MS' which isn't true by any metric, and then said 'Believe what you want but I only see Sports games and shooter on the charts' which is completely ignorant of actual sales and such. I wouldn't call the devs behind Killer Instinct 3 credible developers in the sense that you probably mean it. They don't have a good track record. January is when everything will drop like a rock. PS4 and Xbox One may be the exceptions purely because demand may carry over into the new year. I don't see either console hitting their baseline until around Summer. Correct me if I'm wrong but I was under the impression that the Kinect Sports franchise was heavily bundled, at least in the Holidays. I seriously doubt either of those games sold that well on their own. Did any of them make it in the top 10 NPD charts? Microsoft really seems to be focusing their stock on the American market while Sony is still launching the PS4 in new countries. I think there's a good chance that the XB1 will outsell PS4 in the States in December but I think Sony will likely sell more worldwide. Agreed. I won't go as far as saying it's likely, but MS is certainly in the game for December. That's the theory, correct. But the truth is, we don't know their production capability. That 1 million per month figure is just a guess, and a Pachter guess at that. We also don't know if they held any pre-launch produced stock for December. We don't know if they will react to strong XB1 sales and divert units to this market. In a nutshell, we don't know anything. We'll have to wait and see. I have yet to see either system in the wild (my PS4 came in the mail). I've been out a few times since the launch of both and no one has them here in my little corner of Canada. Not even a good estimate? BF4 is one of the most "next gen" games. To be fair, they only update on weekly intervals, so the 1.9M seems approximately correct for the Dec 7th date attached to it. Even so, it's within 5% of the actual, which is well within a margin of error for things like this. Well, I think we are underestimating what Sony can supply and overestimating demand somewhat in this scenario assuming what events like the last best buy release is any indication in NA (both more demand and supply for the PS4, at least on the west coast). I'd acutally be willing to guess that the demand will start to sputter out for both on the 15th due to shipment timings creating either real or artificial limitations on both platforms. I mean, how many times at how many different locations is the same person willing to line up and subsequently fail to pick up a console if they were intending to buy this year (can't really count scalper sales twice...)? There has to be a limit and looking at a window of 3 days in the following week to net enough time to move substantial untis seems like a strech barring black friday style release events. Both consoles selling in the 400k-500k region seems very reasonable to me for december (US only). Assuming that there will be another ~1m month for either seems a bit reaching right now, even though the possibility exists. Looking at some past November launches, it's worth noting this: consoles that launch in November do not enjoy the December bump, for obvious reasons. You can expect the mature consoles to roughly double their November sales next month. The new consoles - if stock is plentiful - should sell roughly equal to their launch month. Both games were just outside the top 10 in their release months iirc from the old npd threads. I don't believe the first game was bundled at all for the first year it was available. Either way, like Wii Sports, a bundle sale would be virtually the same as a "real sale", since Kinect Sports and Dance Central were the number one reasons to own a Kinect. And in the context of the discussion I was having (re: mm and rare) bundling semantics would be the pot calling the kettle black, no? I think the Vita can find new life as a PS4 companion and indie machine. It would help if it was cheaper (specifically the memory cards) which I think it will be eventually and it will take a few years as PS4 in general gets more established but it could be done. Especially if they can ever figure out how to improve remote play on non-local networks. GAF predictions can often be within 5% of the actual numbers as well. That doesn't mean GAF predictions have any reliability. I've seen some Xbox stock in stores, but I've never seen a PS4 in the wild. Sony needs to flood the market again. Then again, maybe that is where we are going as a society. You look around in restaurants and everyone is on their phones instead of talking to each other. It is weird, and not a pleasant thing to see. As I am pushing 40, though, it's possible I'm in one of the last generations that is put off by that behavior. I just turned 27 and I'm right there with you brother. Microsoft being pretty smart flooding the US with stock. Gonna grab those early adopters who will take whatever console they can get, and may not buy the other for a couple years, if ever. It'll be a very interesting to see what happens. There is every chance MS will win Dec NPD. No idea about Jan, Feb, March etc. Maybe Titanfall will give them March but Sony has made great inroads into the US so I doubt MS will dominate the market this gen as they did last. Which in many ways is already a boon to Sony. As was mentioned previously in this thread, allocations for regions were made months in advance, prior to sony knowing what kind of demand there was in the U.S, so they promised units to Asia that are probably already pre-sold via preorders. They can't just divert these to North America on the fly. Also, any pre-launch stock would have been sold by now. It doesn't make sense for sony to hold onto them if the demand is there. Finally, I agree that its no means guaranteed that xbox will take the top spot, but I think that many people are dismissing it too readily, and all signs point to a competitive race in the US in december. People were lining up to not get the Wii for months. Overall I didn't do very well at all...I was over-optimistic every single time and over-shot multiple sales figures by 100K. But then again, GAF predictions this month were all over the place, so relatively speaking I don't think I did that poorly. I'm not critiquing your opinion but why would you say Microsoft is smart to focus on the US at the expense of other territories? Is he claiming to actually know how many units Sony and MS are producing and shipping to each region? Because I find that hard to believe. Saw three yesterday at Walmart here on Long Island, somewhat hidden in a little locked glass case. Some lady was buying one as a gift. You can read his post and the context surrounding it and form your opinion, but he did not specify whether those were his guesstimates or leaked numbers from his sources. However, I give him the benefit of the doubt, as he has been pretty accurate so far on Sony internal matters. I could be entirely mistaken but I feel like the US is the prime area to sell a massive amount of units as quickly as possible. Especially with our culture around the holidays. Is that a poor opinion? Isn't the same thing seemingly happening with Wii U? Maybe it's just because there are so many kickstarter projects out there, but I've seen quite a few have a Wii U tier, and actually hit that goal. A lot of those have Vita, or PS3/360 as well. And yet despite the massive lead in the US last gen, PS3 will outsell the 360 WW. The US is very important, but a massive focus there is limiting. Edit: This question has been asked before, but once again why are stores going to continue to stock Vita. If most of the sales are digital, that doesn't help retailers at all. Most of their services are US centric and dependent anyways. So cater to those that can consume. No, it's definitely a fair point. There's a desire for the product in the US - the NPDs have certainly shown that. Their machine does seem to focus on the American customer. As far as I know, the TV control stuff doesn't work here in Canada and we're neighbors. Although they refer to it as "weekly sales figures at retail," they're actually deceiving you. It's really just a guess, just like your average GAFfer. These figures are usually wildly different from real NPD sales. When NPD releases, some of numbers magically change to figures more in line with real NPD sales...many times by a significant amount. The fact that they steal NPD's hard work is quite frankly despicable. That's right...for full access to their stolen (massaged) NPD figures and their made-up estimates that they call "sales figures," you only need to pay thousands and thousands of dollars. I get that and many folks in line on the 8th were expressing a similar sentiment, which is why they bothered to line up overnight at all. What I don't think is that either the PS4 or the Xbox1 have the same Wii style draw to them, initially or over the life of the console. Time will tell of course and the ability to ship and supply is different this time around as well. They won't stock it that well for that much longer, but the memory card markup probably helps greatly. The LTD sales aren't that bad, and looking at the price of similar capacity SD cards, there's a nice amount of markup there to split between Sony and the retailers. It says something to me when Best Buy is willing to drop the price of the 32GB to $45 on a sale (and IIRC, more than once). Well like I said, it'll be interesting. It'll be hard to tell what the temperature of the industry is going to be once Xbone sales start slowing down in the US. It's hard to imagine a repeat of last gen considering the price tag and lack of power on the Xbone, but who knows. I also doubt Titanfall is going to move Xbones because of the massive 360 install base.